Acrylic, clear impregnation varnish that does not peel off nor yellow. Use it to compliment the texture of natural stones, creating a permanent wet look. Protects the lined floor grouting material from cracks, deterioration and stain penetration. 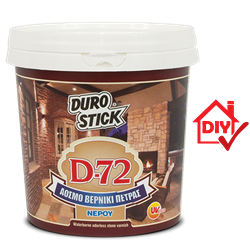 Recommended for use on interior wall and floor surfaces lined with natural stone, slate and slabs as well as artificial stone, decorative bricks, porous blocks and colored pebbles etc. 1lt/8-10m² per coat, depending on the absorbency of the surface.